Home › Sports › Is Klay Thompson’s 37-Point 3rd Quarter The Best Quarter In NBA History? 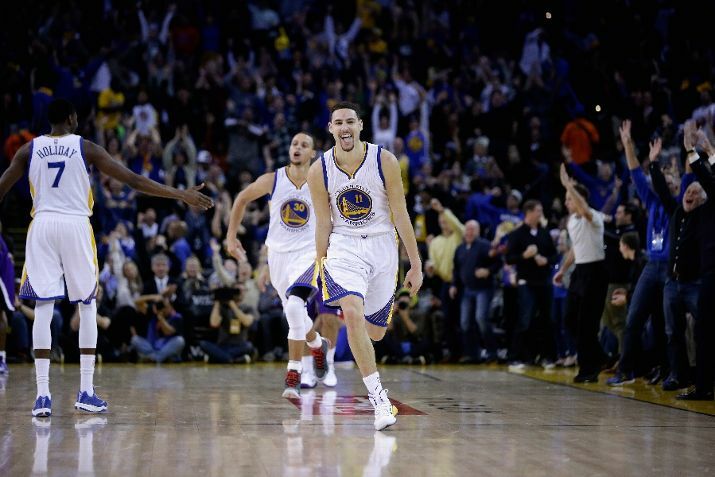 Is Klay Thompson’s 37-Point 3rd Quarter The Best Quarter In NBA History? *This column was originally published on The Sports Fan Journal. After the news came out on Kobe Bryant missing the rest of the season with a torn rotator cuff in his right shoulder, two men had to step their game up the most in basketball on Friday night: James Harden and Klay Thompson. With Bryant making the starting team for the Western Conference in the All-Star Game thanks to his crazed fans, Harden and Thompson were the two most likely candidates to take over for him in the starting lineup, with a plethora of point guards that could also join Thompson’s teammate and leading vote getter, Stephen Curry. Before halftime began for the Golden State Warriors’ game against their Bay Area rivals, the Sacramento Kings, it was Harden who seemed to have taken advantage of Bryant’s injury. While Dwight Howard left the Houston Rockets’ game versus the Phoenix Suns, Harden put on a show of 33 points, 10 assists, six rebounds, three steals, and also added a block to his stat-stuffing night. The stats were huge, but it was Harden’s clutch gene that was the real MVP, as he crossed up P.J. Tucker and made a 20-foot jump shot with time expiring, to win the game 113-111. In the first, second, and fourth quarter of the Warriors contest versus the Kings, Thompson only shot a combined 3-for-12 for 15 points. If the game was only three quarters, Harden would have gone home with the shooting guard belt for the night, but hey, that’s why we thank the Warriors biggest fan aka The Based God for there being a third quarter. Most of my biggest memories in recent sports history have been the Giants winning their three World Series in five years, Derek Jeter’s game-winning hit in his last home game at Yankees Stadium, and falling to my knees right when the ball came out of Colin Kaepernick’s right hand at the end of the 2014 NFC Championship Game and then my head falling to the carpet when Richard Sherman tipped the ball into the hands of Malcolm Smith. Never did I think I would have a ‘never forget’ memory from a late January Warriors game. But, then it happened. It was like watching a YMCA basketball game where the one kid is a foot taller than everybody else and even if all five guys are hovering around him, there’s one simple game plan: Get that man the ball! In the third quarter at the Oracle Arena, Klay Thompson was that kid, just this time he was wearing a white Golden State Warriors jersey with No. 11 across his chest, which was the same number of three-pointers he made that night. Those moments in sports that don’t even feel real are truly the realest, the trillest, and the ones that will last a lifetime. The second part of Draymond’s quote is how I felt the whole time watching Thompson throw up shots like he was playing a game of H-O-R-S-E with his buddies. What really wouldn’t have felt real was if any of those 13 shots ringed out of the hoop. If James Harden was the MVP of his game, then we better come up with a different acronym for Thompson. For the game, he finished with 52 points on 16-of-25 from the field, five assists, four steals, and two blocks. From beyond the arc he was 11-for-15 (73.3 percent), which is the highest shooting percentage in NBA history for any player that shot at least 15 three-pointers in one game. Was Thompson the MVHC (Most Valuable Heat Check)? Or maybe the MVBMF? The ‘B’ stands for bad in that one and you can figure out what the ‘MF’ stands for on your own. Both options, including the usual MVP, fit the bill for Thompson’s night. Either way, Klay Thompson stepped outside of his sidekick role and had the greatest quarter in NBA history, preserving his spot in the NBA All-Star Game as a bonafide star. ‹ San Francisco Giants: Who Bats Leadoff?